Steam mops will help you kill 99.9% of bacteria and germs* without the use of harsh chemicals and detergents that you’d normally use to rid your floors of dirt. 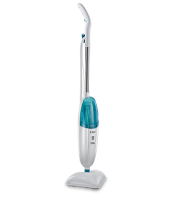 Light and easy to use, the steam mop is an essential tool in your housekeeping collection. *Test method based on EN13697, excludes carpets, applies to sealed floors only.